Hymns are a component of religious practice, but as Dr. Eric Hoenes del Pinal explained to Miami students and faculty, they can also be a lightning rod of division within a community and a key factor in fostering conversion. "They disturb," Dr. Hoenes del Pinal said. "They unsettle the sometimes uneasy peace that exists between all these congregations in what's an increasingly crowded religious marketplace. Dr. Hoenes del Pinal presents his research to the audience. "Dr. Hoenes del Pinal is a cultural and linguistic anthropologist and assistant professor in the Department of Religious Studies at the University of North Carolina at Charlotte. 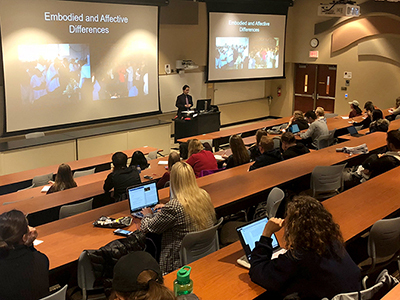 His March 29 lecture, The Politics of Audibility: Language, Music and Piety in a Q’eqchi’-Maya Catholic Community, was based on his ethnographic research about how language and nonverbal communication drive social and religious change in Guatemala. Hoenes del Pinal studied two religious communities in the San Felipe parish in Cobán, Guatemala — Mainstream Catholics and Charismatic Catholics. The two groups, though both Catholic, embody important differences in how they practice religion. The Mainstream Catholics have more traditional practices, he explained, while the Charismatic Catholics implement different instruments, dancing, and loud chanting into their religious rituals, as well as singing their hymns in Spanish rather than the local indigenous language. "When Mainstream Catholics wanted to complain about the Charismatics, they would comment on things like the level of noise they made during their meetings … and importantly that they only wanted to speak in Spanish," Hoenes del Pinal said. "These criticisms weren't really about the theology of the Charismatic Catholics, it was all about the things that they did and how they sounded." However, there is something stirring about the way that the Charismatic Catholics practice Catholicism and sing hymns. "The Charismatics' songs are kind of seductive," he said. "They beckon you to come nearer to the chapel. Their rhythm asks you to join a community. You may find yourself abandoning the position as a skeptic and taking up, maybe just for a moment, the position of the lyricist who wants to feel the Holy Spirit." Hoenes del Pinal's lecture encouraged the audience to consider hymns in a new context. "I like how the lecture focused on hymns," sophomore anthropology major Miranda Oates said. "I've never really thought of them as a vehicle for change or conversion." "Dr. Hoenes del Pinal is producing some of the most innovative and exciting anthropological work at the intersection of religion, language, sound, and embodiment," said James Bielo, assistant professor of anthropology. "We were thrilled he was able to visit Miami and engage students directly. I was particularly enthused by the lively Q&A session following his public lecture; it's always encouraging to see hands still raised when time is up!" The lecture was part of the Indigenous Speakers Series, courtesy of the A.T. Hansen Anthropology Fund, and presented by the Department of Anthropology. It was co-sponsored by the Miami University Humanities Center, Department of Comparative Religion, the Latin American Studies Program and the Department of Global and Intercultural Studies.